The two major research areas are rotor aerodynamics and wind turbine design, supported by some smaller topics like analysis of wind, turbulence and gusts, and scenario development for offshore wind power, and research towards the use of wind power in the built environment. Almost all research of the group is done in close cooperation with other research groups at Delft University, in which the wind energy group acts as integrator of knowledge. This cooperation covers research groups at Aerospace Engineering as well as research groups at all Duwind faculties. The group has strong ties with ECN in the Netherlands, and with international partners. 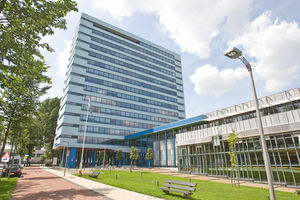 With ECN, TU-Delft was one of the founding members of the European Academy for Wind Energy, in which universities and institutes in 11 European countries cooperate. Furthermore the group takes part in several research projects of the International Energy Agency, which provides a platform for cooperation with research institutions in the US, Canada and Japan. Find an overview of our publications in PURE. Our group studies sound that is borne from air, its turbulence, and its interaction with solid bodies. The group has a unique experimental wind tunnel to test model rotors, the Open Jet Facility (OJF). Wind conditions for wind turbine design. The design of a kite power system is highly connected to its dynamic behavior. In the design of wind turbines all disciplines come together.